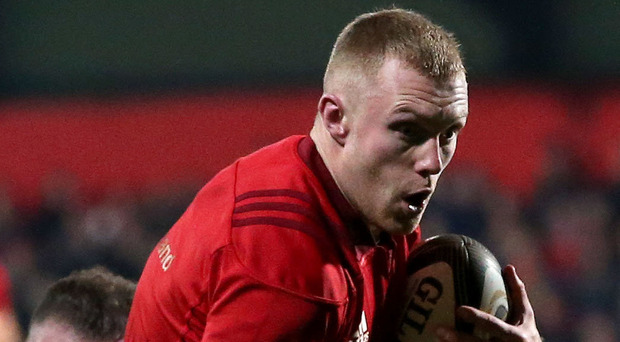 An electric eight-minute hat-trick from Keith Earls helped Munster on their way to a thumping 44-14 Guinness PRO14 win over Edinburgh. Returning from international duty, Ireland winger Earls crossed after 29, 33 and 37 minutes as Munster cruised to a 34-7 interval lead, their six-try haul dwarfing South African winger Duhan van der Merwe's effort midway through the first half. A full house of 8,008 watched Tyler Bleyendaal and Chris Farrell sandwich Van der Merwe's second try in the 68th minute, as the pair added to Earls' trio of scores and earlier touchdowns from Farrell and Andrew Conway (2). It was Munster's third successive bonus-point victory, putting them within three points of Glasgow Warriors at the top of Conference A. While Edinburgh's selection was curtailed by injuries and internationals being rested, Munster welcomed back captain Peter O'Mahony and fit-again duo Conor Murray and Farrell made their first starts of the season. While 19-7 up, Munster's forwards laid the platform for Earls' first try, with the Irishman collecting the scoring pass off the back of a line-out maul. With the bonus point in the bag, the hosts' back-line did the damage for the next score as Farrell's brilliant offload set up fizzing full-back Mike Haley, who released Earls to cross again. Conway's clever work then sent Haley haring over halfway, and with Edinburgh struggling to reset, nice hands out to the left put Earls dashing over to steal the show and set Munster well and truly on their way.